Her approach to the law has been described as cautious, though she has been influential in shaping jurisprudence in cases involving gender discrimination, women's reproductive health and international law. She was the principal author of a landmark brief that led Supreme Court in 1971 to apply the the equal protection clause of the 14th Amendment to women. 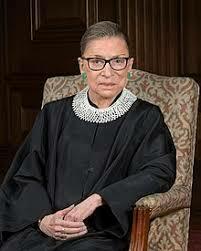 Ginsburg, the second of four women to serve on the high court, was appointed by President Bill Clinton in 1993. Before joining the court, she worked as the director of the ACLU's Women's Rights Project. News of Ginsburg's fall comes on the same morning as the formal investiture of Justice Brett Kavanaugh, President Donald Trump's second nominee to the high court.